Painswick St Mary’s lies in the centre of the Benefice and is the largest church and parish. Painswick.is in the Gloucestershire Cotswolds and has a population of about 2000 peopl. The village is known as the ‘Queen of the Cotswolds and is one of England’s oldest ‘Wool Towns’, the wealth from wool production and weaving in the area gave the town many fine buildings, particularly St. Mary’s Church. 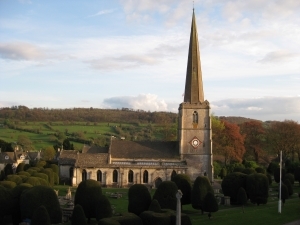 Whenever you approach Painswick, from north, south, east or west, your eyes will rest upon the tall, beautiful spire of St. Mary’s Church with its weathercock standing some 639 feet above sea level. As a church in the heart of our community we are committed to sharing the love and hope of Jesus Christ with everyone who lives here whatever their age or background. 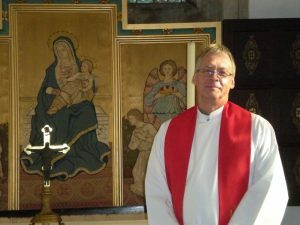 Our church is open all day, and many visitors come to enjoy the peace of our church building and churchyard. Painswick Church is also very famous for its 99 Yew Trees (dating back to the 18th century), which stand in the large churchyard. The legend states that 100th tree will never grow but who knows!